Spell Towers use the power of your favorite Ancient to defend your Stronghold. Change your Ancient to change the power. Ancients are assigned into 5 different Elements, each of which have their own unique spell which can be bound to a Spell Tower. The spell may affect the Spell Towers behavior, such as Attack Range and Splash Damage Radius. Some Ancients have their unique Spell Tower ability, such as Golgogg's Flame Sprayer, and Zillah's Insanity Potion. Tower suppression is one of the perks of the spell tower. This feature will reduce the effective level of an attacker's ancient if they are using the same ancient which you currently have assigned to one of your spell towers. 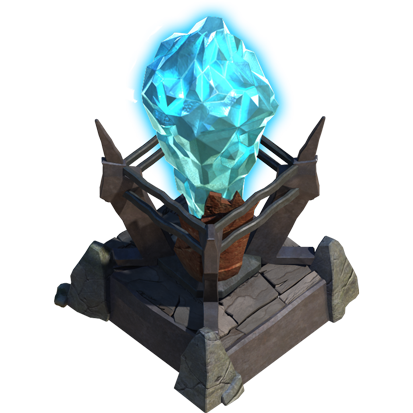 This means if an attacker uses an ancient which you have assigned to one of your spell towers, they will do less damage or healing to their troops based upon the rarity of the ancient you have assigned to the spell tower. An attacker's ancient cannot be reduced below level 1. 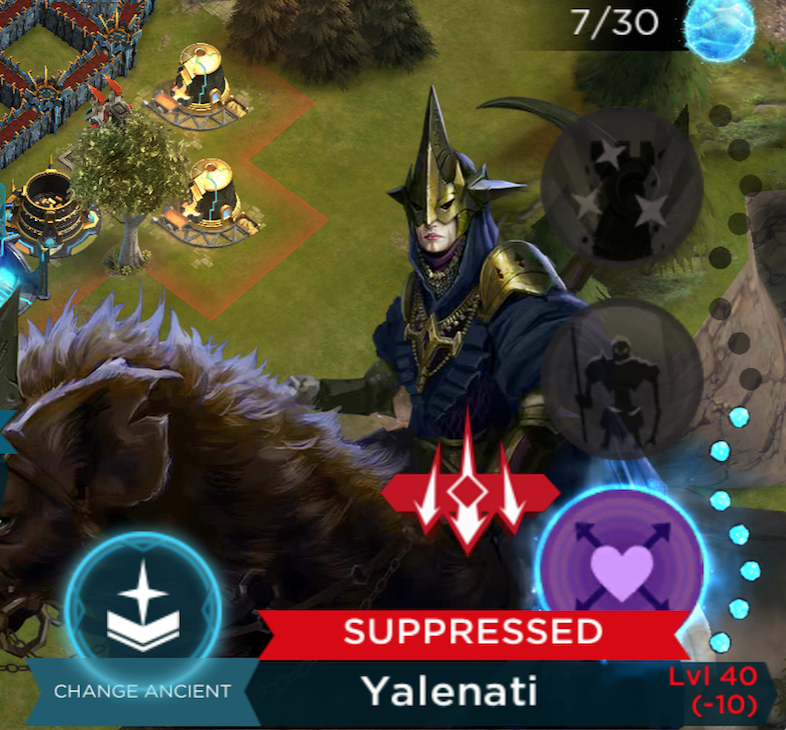 Below you can see the indicator for a suppressed Ancient in the Ancient selection interface. The chart below will help you to figure out what level of suppression is applied based on an ancient's rarity. Q: Which game modes is Tower Suppression Active in? A: Tower Suppression will be in all game modes. Yes, that includes kingdom raids. Q: Will Suppression go away once the respective Spell Tower containing my Ancient is destroyed? A: No, Suppression lasts the entire length of the battle regardless of the state of the Spell Tower containing your Ancient. Q: Is my Ancients Rarity taken into account for Suppression or is the Ancient in the Spell Tower? A: Suppression is a defensive mechanic. Suppression will take into account the Defender’s Ancient rarity that they have inside the Spell Tower. Q: Kestra gains an ability at level 31 - If Kestra is reduced below this level will she lose the ability to use this? Q: Will Suppression effect my Ancients Rarity? Ancient level 1: Deals 19 - 20 damage in an area. Affected units then burn for an additional 19 - 20 damage over 3 seconds. Ancient level 4: Deals 22 - 24 damage in an area. Affected units then burn for an additional 22 - 24 damage over 3 seconds. Ancient level 9: Deals 25 - 28 damage in an area. Affected units then burn for an additional 25 - 28 damage over 3 seconds. Ancient level 14: Deals 29 - 31 damage in an area. Affected units then burn for an additional 29 - 31 damage over 3 seconds. Ancient level 19: Deals 32 - 35 damage in an area. Affected units then burn for an additional 32 - 35 damage over 3 seconds. Ancient level 24: Deals 39 - 42 damage in an area. Affected units then burn for an additional 39 - 42 damage over 3 seconds. Ancient level 29: Deals 45 - 49 damage in an area. Affected units then burn for an additional 45 - 49 damage over 3 seconds. Ancient level 34: Deals 52 - 56 damage in an area. Affected units then burn for an additional 52 - 56 damage over 3 seconds. Ancient level 39: Deals 58 - 64 damage in an area. Affected units then burn for an additional 58 - 64 damage over 3 seconds. Ancient level 44: Deals 65 - 71 damage in an area. Affected units then burn for an additional 65 - 71 damage over 3 seconds. Ancient level 49: Deals 78 - 85 damage in an area. Affected units then burn for an additional 78 - 85 damage over 3 seconds. Ancient level 1: Deals 22 - 24 damage to a single target. Ancient level 4: Deals 26 - 29 damage to a single target. Ancient level 9: Deals 30 - 33 damage to a single target. Ancient level 14: Deals 34 - 37 damage to a single target. Ancient level 19: Deals 38 - 42 damage to a single target. Ancient level 24: Deals 46 - 50 damage to a single target. Ancient level 29: Deals 54 - 59 damage to a single target. Ancient level 34: Deals 62 - 68 damage to a single target. Ancient level 39: Deals 70 - 76 damage to a single target. Ancient level 44: Deals 78 - 85 damage to a single target. Ancient level 49: Deals 94 - 102 damage to a single target. Ancient level 1: Deals 10 - 12 damage in a large area. Affected units are frozen for 2.5 seconds. Ancient level 4: Deals 12 - 14 damage in a large area. Affected units are frozen for 2.5 seconds. Ancient level 9: Deals 14 - 16 damage in a large area. Affected units are frozen for 2.5 seconds. Ancient level 14: Deals 16 - 18 damage in a large area. Affected units are frozen for 2.5 seconds. Ancient level 19: Deals 17 - 20 damage in a large area. Affected units are frozen for 2.5 seconds. Ancient level 24: Deals 21 - 25 damage in a large area. Affected units are frozen for 2.5 seconds. Ancient level 29: Deals 25 - 29 damage in a large area. Affected units are frozen for 2.5 seconds. Ancient level 34: Deals 28 - 33 damage in a large area. Affected units are frozen for 2.5 seconds. Ancient level 39: Deals 32 - 37 damage in a large area. Affected units are frozen for 2.5 seconds. Ancient level 44: Deals 35 - 41 damage in a large area. Affected units are frozen for 2.5 seconds. Ancient level 49: Deals 43 - 50 damage in a large area. Affected units are frozen for 2.5 seconds. Ancient level 1: Deals 10 - 12 damage in an area. Affected units are confused for 5 seconds. Ancient level 4: Deals 12 - 14 damage in an area. Affected units are confused for 5 seconds. Ancient level 9: Deals 14 - 16 damage in an area. Affected units are confused for 5 seconds. Ancient level 14: Deals 16 - 18 damage in an area. Affected units are confused for 5 seconds. Ancient level 19: Deals 17 - 20 damage in an area. Affected units are confused for 5 seconds. Ancient level 24: Deals 21 - 25 damage in an area. Affected units are confused for 5 seconds. Ancient level 29: Deals 25 - 29 damage in an area. Affected units are confused for 5 seconds. Ancient level 34: Deals 28 - 33 damage in an area. Affected units are confused for 5 seconds. Ancient level 39: Deals 32 - 37 damage in an area. Affected units are confused for 5 seconds. Ancient level 44: Deals 35 - 41 damage in an area. Affected units are confused for 5 seconds. Ancient level 49: Deals 43 - 50 damage in an area. Affected units are confused for 5 seconds. Ancient level 1: Radiates 68 - 85 damage over 0.5 seconds to enemies in close range and cleanses positive buffs. Ancient level 4: Radiates 80 - 100 damage over 0.5 seconds to enemies in close range and cleanses positive buffs. Ancient level 9: Radiates 92 - 115 damage over 0.5 seconds to enemies in close range and cleanses positive buffs. Ancient level 14: Radiates 104 - 130 damage over 0.5 seconds to enemies in close range and cleanses positive buffs. Ancient level 19: Radiates 116 - 145 damage over 0.5 seconds to enemies in close range and cleanses positive buffs. Ancient level 24: Radiates 140 - 175 damage over 0.5 seconds to enemies in close range and cleanses positive buffs. Ancient level 29: Radiates 164 - 205 damage over 0.5 seconds to enemies in close range and cleanses positive buffs. Ancient level 34: Radiates 188 - 235 damage over 0.5 seconds to enemies in close range and cleanses positive buffs. Ancient level 39: Radiates 212 - 265 damage over 0.5 seconds to enemies in close range and cleanses positive buffs. Ancient level 44: Radiates 236 - 295 damage over 0.5 seconds to enemies in close range and cleanses positive buffs. Ancient level 49: Radiates 284 - 355 damage over 0.5 seconds to enemies in close range and cleanses positive buffs. Ancient level 1: Deals 10 - 12 damage in an area. Affected units take 10% increased damage and cannot be healed for 10 seconds. Ancient level 4: Deals 12 - 14 damage in an area. Affected units take 10% increased damage and cannot be healed for 10 seconds. Ancient level 9: Deals 14 - 16 damage in an area. Affected units take 10% increased damage and cannot be healed for 10 seconds. Ancient level 14: Deals 16 - 18 damage in an area. Affected units take 10% increased damage and cannot be healed for 10 seconds. Ancient level 19: Deals 17 - 20 damage in an area. Affected units take 10% increased damage and cannot be healed for 10 seconds. Ancient level 24: Deals 21 - 25 damage in an area. Affected units take 10% increased damage and cannot be healed for 10 seconds. Ancient level 29: Deals 25 - 29 damage in an area. Affected units take 10% increased damage and cannot be healed for 10 seconds. Ancient level 34: Deals 28 - 33 damage in an area. Affected units take 10% increased damage and cannot be healed for 10 seconds. Ancient level 39: Deals 32 - 37 damage in an area. Affected units take 10% increased damage and cannot be healed for 10 seconds. Ancient level 44: Deals 35 - 41 damage in an area. Affected units take 10% increased damage and cannot be healed for 10 seconds. Ancient level 49: Deals 43 - 50 damage in an area. Affected units take 10% increased damage and cannot be healed for 10 seconds. Some spells (such as Jal's "Oasis" and Siku's "Battle Lament") can protect allies from all common debuffs. What does this mean? A debuff is the contrary of a buff. It is an effect that while it persists hampers the target in some way. The table below highlights the difference between your troops getting hit by a spell tower, without/with a debuff spell cast on your troops. A group of troops are hit by a Cursed Touch Spell Tower. They take "x" initial damage, start taking 10% increased damage, and can no longer be healed by healing spells, or by Paladins for 10 seconds. 1 second later, you drop Siku's Battle Lament spell (level 1: lasts 6 seconds) on those troops. Troops no longer take 10% increased damage, and can be healed by Paladins for the next 6 seconds (the duration of Battle Lament spell). The Battle Lament spell wears off, troops begin to take 10% increased damage and can no longer be healed for the next 3 seconds (which is the remainder of the 10 second Cursed Touch spell effect). In the table below, the red cells represent the period where Cursed Touch is affecting your troops, and the green cells are when the Battle Lament is dispelling the debuff. The troops are still affected by the Cursed Touch for a total of 4 seconds out of the 10 seconds duration. Your troops approach a Cursed Touch Spell Tower. You immediately drop Siku's Battle Lament Spell (level 1: lasts 6 seconds). 1 second later, the Cursed Touch Spell Tower hits your troops. The affected troops take "x" initial damage, the rest of the effects have been debuffed by the Battle Lament spell. 5 seconds later, the Battle Lament spell wears off. The affected troops now take 10% increased damage and cannot be healed by Paladins for the remaining 5 seconds of the Cursed Touch spell effect. The troops are affected by the Cursed Touch for a total of 5 seconds. This demonstrates the importance of dropping the Battle Lament spell after the troops are hit, however if your Battle Lament duration lasts longer than 10 seconds, it would be far more beneficial to drop the spell earlier.